Adalay, Lawrence of Berkley, and I hit the road Sunday afternoon for Port Huron in hopes of testing the new AF-S NIKKOR 70-200mm f/2.8G ED VR II. 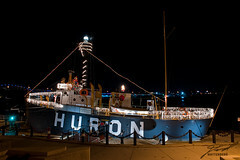 Since darkness fell so early though I thought I'd take a crack at grabbing the Lightship Huron with it's holiday lights and Santa on the pilot house. It was cold and rendered the same problems with obstructions as I recall from my earlier attempts, but overall I'm happy with the results.